I made this Italian cheese bread to go with the pizza chicken breast roll ups from my last post. I had considered making some pasta or some potatoes to go along with this dish, but I was in the mood to make some bread. And I actually think the bread was the better choice over pasta or potatoes. When I was a kid, bread was served with every meal of the day. As I have mentioned before my dad was a meat and potatoes kind of guy, but bread was a must with the meal. Even though I love bread, I don’t serve bread with every meal. My family likes bread, but it is not a must with every meal. Plus the fact my mom made her own bread, so we were served homemade bread with our meals. In my case I don’t have time to make the homemade bread all the time, so the store bread is not as appealing. But when I do have the time I love to make homemade bread and the family loves to eat it. Before my blogging days I usually made the same bread time after time. Since I have started blogging and reading other blogs it is amazing the different kinds of breads out there. Breads with herbs and cheese, I would never have envisioned before my blogging days. The one thing that I have not done to this day is bake with different types of flour; I have always used all-purpose flour. So my next step is to try different flours such as rye or even whole wheat. To be honest these flours make me a little nervous, so hopefully I will get the nerve to try something new. I found this bread at allrecipes.com. The recipe was intended for a bread machine, but since I don’t have one I decided to make it the old fashion way, just by kneading it by hand. I did change some of the ingredients since I didn’t have everything on hand. The flavors of the mozzarella, Parmesan cheese, Italian seasoning, and the onion powder came together nicely. In fact when I finished kneading the dough it smelled so wonderful that I had to taste the dough. The bread was light and soft, and the flavor was wonderful. In a large bowl add water, brown sugar, granulated sugar, and yeast. Stir until well blended. Let set for a few minutes and add the olive oil and mix well. Mix in 2 cups of the flour along with the salt, Italian seasoning, onion powder, and cheeses, mix until all is blended. Gradually add the rest of the flour, working it with your hands then kneading the dough until it is nice and soft and just so it barely sticks to your fingers. Grease the bottom of the bowl and turn the dough so that the surface is coated. Let rise for 45 to 60 minutes until dough has doubled in size. 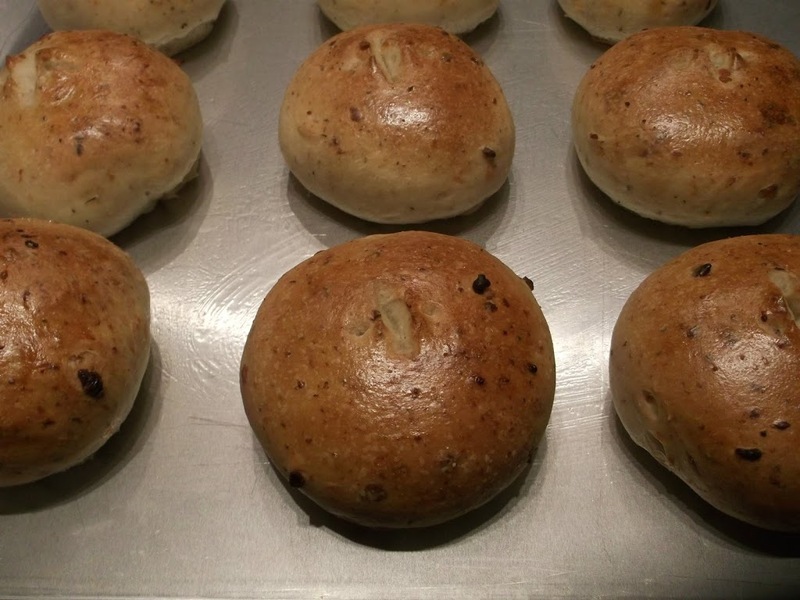 Divide the dough into 16 pieces and make a nice ball by tucking the side to the bottom of the ball. Place on a greased baking sheet and pat down, so that you have a nice round disk. Let rise for about another 30 – 45 minutes or to about double. Preheat oven to 375 degrees F. Beat egg white and water together. Brush each bun with the egg wash and bake for 10 minutes. Remove from oven and brush with egg wash one more time and place back into oven and continue baking for another 4 to 6 minutes until bread is nicely browned. Cool on wire racks, bread can be served warm or you can cool completely and serve cold. Bread freezes nicely. 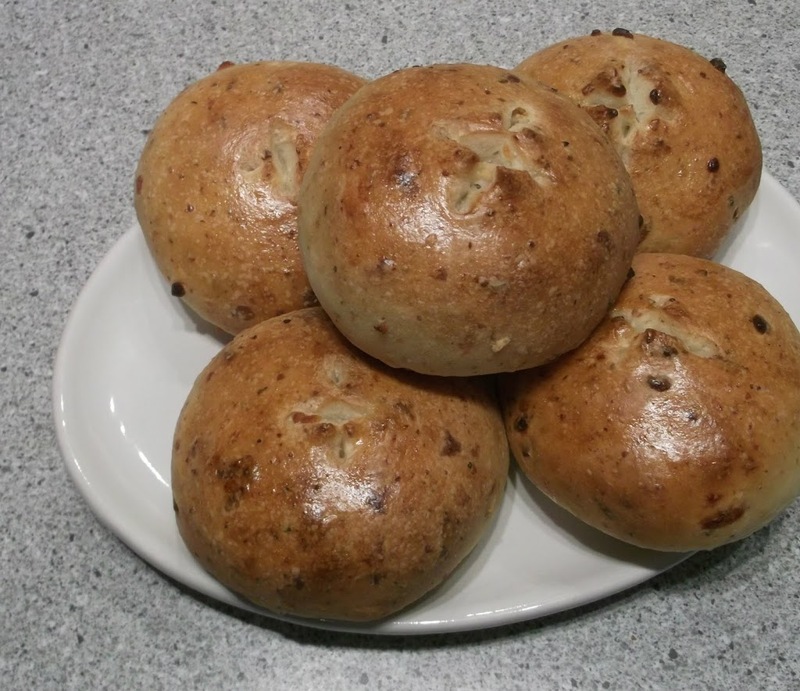 I made rolls with my bread or you can shape the dough into a loaf and bake it like that as well. Your rolls look wonderful. Your kitchen must have smelled wonderful while they were baking. Really nice looking bread! I love how you’ve flavored it. We’ve been doing a lot of bread baking lately, and I doubt if we’ll buy packaged bread again – what one makes in one’s kitchen is so much better! Really nice – thanks. Beautiful! 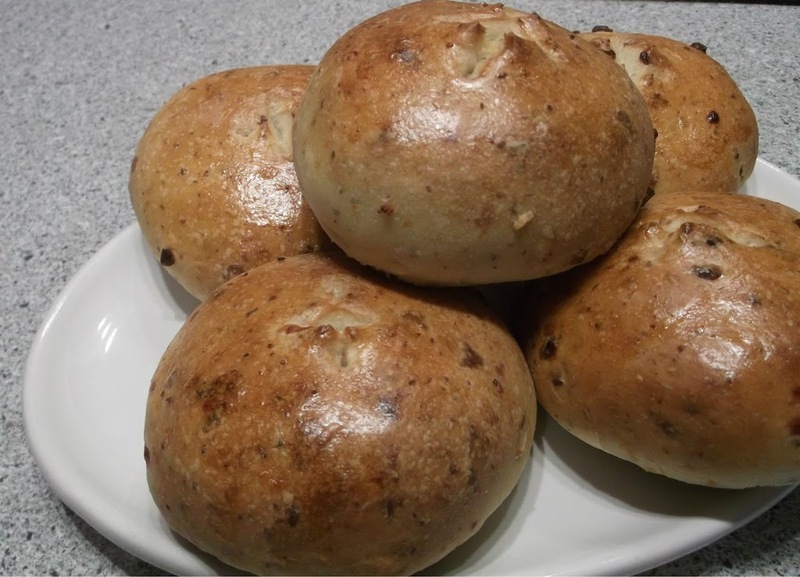 I love homemade bread and these rolls look and sound wonderful. I am sure they tasted great with the chicken. Those buns look amazing! I’m absolutely making them..they won’t last five minutes!